Must be either Fusion Summoned, or Special Summoned by banishing 1 Thunder monster from your hand and 1 Thunder Fusion Monster you control, except “Thunder Dragon Titan” (in which case you do not use “Polymerization”). When a Thunder monster’s effect is activated in the hand, even during the Damage Step (Quick Effect): You can destroy 1 card on the field. If this card would be destroyed by card effect, you can banish 2 cards from your GY instead. Thunder Dragon Titan wraps up this week of Thunder Dragon-focused cards. Three Thunder Dragon monsters isn’t tough at all for this archetype to put out, and, in some cases, could be done in decks that run other Thunder monsters alongside Instant Fusion. TDT is splashable, which is great for a 3200/3200 boss monster. Banish a Thunder monster in the hand and a Thunder Fusion monster you control is ridiculously easy. Instant Fusion and Thunder Dragon equal this card, and for what it can do, that is just robbery. You can’t give up a TDT for another TDT, but that’s a good thing, otherwise you’d run through all three in one turn, activating their effects one after the other, it’s a good balance to the power of this card. If the ATK/DEF and the ease of summoning wasn’t enough, when a Thunder monsters effect kicks in the hand, you get to destroy a card on the field. A good 1-for-1 during either turn, causing disruption on your opponent’s side and creating advantage whenever you activate this effect. The way Thunder Dragons are, this is legitimately an effect that can happen during either turn, EVERY turn. On top of it all, TDT can protect itself. Card effects won’t be able to destroy this card as long as you have two cards in your grave. They don’t need to be Thunder monsters either, so feel free to banish those used spell and traps. However, this protection effect aids you in conjunction with other Thunder Dragon monsters. Banish them to protect your big beater and get pluses off the banished Thunder Dragon monsters. Another effect that can happen during either player’s turn, and possibly EVERY turn. TDT is as good of a boss monster that has come out recently or in some time. If you run Thunder monsters, and have a way to get a Thunder fusion monster like with the Instant Fusion and Kaminari Attack. Even as only a boss monster summoned for raw attack power, as long as you have cards in the grave, this big dragon isn’t going anywhere. I was going to look at Thunder Dragon Colossus to end this week, but since I mentioned this card more and the fact that Colossus is the biggest chase card in Soul Fusion, I opted to look at Thunder Dragon Titan first. Thunder Dragon Titan is a Level 10 LIGHT Thunder Fusion with 3200 ATK and DEF and requires three Thunder Dragon monsters as material. The Fusion Materials are easy to obtain in pure Thunder Dragons, but it has an alternate summoning condition in case you want to run the engine instead. 3200 ATK and DEF is great, LIGHT is great, Thunder is great. 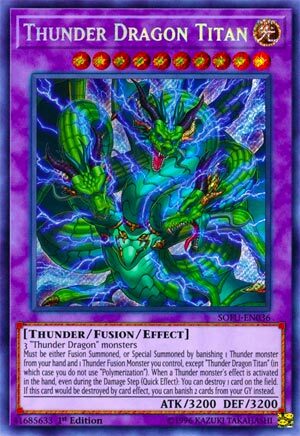 You can Special Summon Thunder Dragon Titan from your Extra Deck by banishing 1 Thunder Fusion you control and 1 Thunder monster from your hand. Instant Fusion into Kaminari Attack gets you the Thunder Fusion and you shouldn’t have a shortage of Thunder monsters in your hand if you’re playing this, so this condition is much easier and maybe better than getting three Thunder Dragons on your field, in your GY, or banished for Thunder Dragon Fusion, though that option is still great to have. When a Thunder monster activates its effect in the hand, even during the Damage Step (Quick Effect), you can destroy 1 card on the field. Quick and easy spot removal that isn’t once per turn is great as long as you have the Thunder monsters in your hand to use, I already mentioned 1 Thunder Dragon can thin your deck 2 cards and get you up to two destructions potentially, Thunder Dragonmatrix from earlier this week can activate its 500 ATK boost in the Damage Step and Thunder Dragon Titan allows you to destroy an opponent’s card and they can’t really respond with much since it is the Damage Step. And that isn’t to mention all the other various Thunder Dragon monsters having hand effects, and one that isn’t Thunder Dragonmatrix also has a Quick Effect in the hand, so this is a great destruction effect that should be live more often than not. Finally, if this card would be destroyed by a card effect, you can banish 2 cards from your GY instead. Destroying this in battle is hard with 3200 ATK and DEF, so it truly only needed effect destruction protection, plus banishing Thunder Dragons in the GY will trigger their effects to do various things, but you can literally banish whatever you want like some used up Spells and Traps that don’t have GY effects and can’t really be added back to your hand. Thunder Dragon Titan is a worthy 2 to 3 of in the Extra Deck of Thunder Dragons and maybe as a 1 of if splashing Thunder Dragons in something else, depending on if you think you can get this live often enough, but that’ll be based on how many Thunder Dragons you fit into the deck you intend to splash them into. Art: 4.5/5 A three headed Thunder Dragon, kinda wish it was Ultimate Thunder Dragon as an omen to BEUD but not putting the Ultimate where this card won’t be in the archetype anymore. Closing the week is a behemoth of a Fusion Monster, in Thunder Dragon Titan. Light, Thunder, Level 10, and a gargantuan 3200 attack and defense, who is Fusion Summoned with Three Thunder Dragon Monsters. So you see at first this card has an alternate Summon condition where you can remove a Thunder Monster from your Hand from play as well as a Thunder Fusion Monster you control, other than this card. Said method of Fusion/Special Summon doesn’t require Polymerization, so that’s a plus, as is having another way to bring this card out. So first, as a Quick effect, when a Thunder effect is activated from the Hand (and a rare case where this works even during the Damage Step) you get to destroy one card on the Field. This is VERY good, better as a Quick effect, and one you should easily and frequently be able to capitalize on. Note, too, you CAN destroy a card, so you aren’t forced into destroying one of your cards if you were in that situation. No specification as to what type of card, or face-up or face-down, or who controls it is beautiful as well. Also, you can protect this card from destruction, that if it were, you can remove two cards from your Graveyard instead. I like they aren’t Thunder specific cards required for that, but I kind of feel they should be. 2 cards over 1 for this may hurt long term, but I guess it is some balance for a really powerful Monster, so I’m not going to gripe over that too much. Really solid card here though, without a doubt. Art: 5/5 Love this picture too. The Thunder is blue which makes me think more of lightning, I feel some gold should be mixed in there, but still really cool.